According to an ECHR press release, “the Court took the decision to bar Ms. Tselovalnichenko in view of her fraudulent and abusive behavior. In particular, in a number of applications lodged with the Court, Ms. Tselovalnichenko had submitted documents which had obvious signs of forgery, while in several others she had lodged applications on behalf of deceased applicants without informing the Court of their deaths”. No further details published, nor provided to our request. Nataliya Tselovalnichenko was informed about the decision by the short letter of the Fourth Section registrar Marialena Tsirli. The letter wasn’t specified names of deceased applicants or forged documents, so she can only guess what happened in absence of concrete facts. Despite all her recent cases related to Russian-Ukrainian conflict are pending in First Section, the decision on her disbarment was made by the president of the Fourth Section, Ukrainian judge Ganna Yudkivska. Coincidently, judge’s husband Georgii Logvynskyi (MP) openly tries to concentrate in own hands all legal aid to the victims of war in Donbass for political and business benefits of such monopoly. Only once, at the beginning of 2018, ECHR Fourth Section wrote a letter concerning deceased applicants, Ms. Tselovalnichenko recalls. Those two applicants were victims of non-enforcement of national courts decisions, participants of successful ECHR petitioning campaign engaged hundreds of people from all regions of Ukraine. During the campaign lawyer and applicants communicated mostly by post. The process of preparing the application and gathering needed copies of documents to attach it sometimes took several months. Unfortunately, relatives of two applicants, sending the copies, failed to tell the lawyer about applicant’s death. Ms. Tselovalnichenko had not known this fact before the Court informed her. In reply, she explained the technique of communication with applicants, the Court discontinued the cases, ordering no sanctions against lawyer or relatives of deceased applicants. She can’t imagine why the story surfaced nearly 8 months later; as for alleged forgery, ECHR was never requested her explanations for any similar issue. Ms. Tselovalnichenko mentions she complained many times for mislaying cases by ECHR Registry and for declaring “clearly inadmissible” legitimate applications by a single judge. Following one of her complaints, Serbian judge Dragoljub Popovic was moved from the Second to Third Section (so, removed from examining petitions from Ukraine) and repetitive applications he rejected were finally recognized as admissible and even prioritized. But Popovic preserved some connections in Kyiv and participated at 2015, as a former judge, in the conference organized by National School of Judges of Ukraine. Judge Dragoljub Popovic also was involved in shady disbarment of Serbian lawyer Mihailo Petrovic in 2010 by the scheme similar to disbarment of Ms. Tselovalnichenko, except no criminal accusations against Petrovic was published. Mr. Petrovic was filed more than 500 applications before ECHR concerning systemic violations of human rights in Balkan countries (mostly, in Serbia) and was secretly disqualified without any trial for 3 applications on behalf of deceased persons. Despite the ban imposed on him, Petrovic continued to petition ECHR as an attorney and as individual applicant claiming the damages he suffered from unlawful conduct at the courts. Reacting to such persistence, ECHR joined and declared inadmissible as abusive his applications, announcing the disqualification of Petrovich by press-release and by letters to Belgrade Bar Association and to the Serbian government. A vast majority of applications lodged by Mr. Petrovic was routinely rejected with the infamous excuse that ECHR doesn’t support individual petitions in public interests (actio popularis), but one of his clients later won his case (Raguz v. Serbia) after 8-year long proceedings in ECHR. We can only guess why Petrovic wasn’t stigmatized as fraudster when it occurred that a few (among hundreds) of his clients are dead; perhaps initiator of repressions against him had enough conscience to restrain own punitive ambitions knowing the people in Serbia and other countries under authoritarian rule usually wait for justice many years and die unsatisfied. All facts known for now says the Court possibly overreacted, punishing Ms. Tselovalnichenko in 2018 and Mr. Petrovic in 2010 without any trial for well-known and inevitable technical problems of mass petitioning, that can’t be seen as proofs of fraud, forgery or intentional abuse (as speculate interested persons) beyond the reasonable doubt. It isn’t clear, however, whether such overreaction was caused by judge Yudkivska’s conflict of interests, or by a habit of the Court’s registry clerks to trash as many petitions as possible instead of careful processing, or by traditional hostility of European judges towards group litigation. Yurii Karmazin, a retired judge and Honored Lawyer of Ukraine, called “nonsense” baseless accusations against Tselovalnichenko, emphasizing he doesn’t see any offensive elements in her behavior. Also, Karmazin connected her shady disbarment with a long-time uncompromising struggle for human rights when Ms. Tselovalnichenko won’t hesitate to bother bureaucratic busybodies in Ministry of Justice of Ukraine and ECHR. In 2012 Luhansk Human Rights Protection Group led by Nataliya Tselovalnichenko started ECHR petitioning campaign to compensate damages caused by non-enforcement of Ukrainian court judgments in favor of victims of Chernobyl disaster and other vulnerable people deprived social benefits guaranteed by the law. Near 2 000 applications were lodged before ECHR during the campaign. Moment of success was reached in 2017 when the Court in pilot judgment in the case Burmych and Others v. Ukraine was found violation of the rights to fair justice, to effective remedy and to protection of property by non-enforcement or delayed enforcement of domestic court decisions in cases of 12 148 applicants, 161 of which are represented by Nataliya Tselovalnichenko. Two years term given to implement Burmych judgment expires in 2019, but it is no signs the Ukrainian Government intends to make necessary payments and change the legislation to solve the problem in time. If friendly settlement of thousands of cases will be failed, such cases must be reopened. Probably, the Government hopes the Court will never do it lacking resources to process all the cases properly and being severely divided. Burmych judgment was supported by 10 to 7 votes. Dissenting judges, Yudkivska and others, voted against joinder the applications proposing to consider them selectively, of course, with usual mechanical rejection of 9/10, despite hypocritical concerns expressed in their dissenting opinion about “endangering” the right to individual petition – as shows statistics, not just endangered, but totally declined and turned to mockery by many evasions of the Court’s mission, such as proposed by Yudkivska and supporters. Another prominent campaign of Nataliya Tselovalnichenko started in 2014 when Luhansk Human Rights Protection Group introduced the legal aid program to help victims of the war in Donbass to claim damages. Effective national remedies don’t exist in this category of cases, because Russian and Ukrainian governments blame each other for the violence, inflaming war and neglecting the suffering of people. Hundreds of thousands of internally displaced persons and refugees are desperate to find justice. Ukrainian legislation established no procedure to assess and compensate damages of the war nor assigned responsibility to the State agencies. Ms. Tselovalnichenko proposed to draft such a bill using sanctions against Russia and supporters of Russian aggression as a source of recovery funding, but the support of this initiative was insignificant due to lack of political will. No legal instruments are created to document horrific violations of human rights to protection of life and property at Eastern Ukraine, such as shooting, bombings, and rocket attacks. 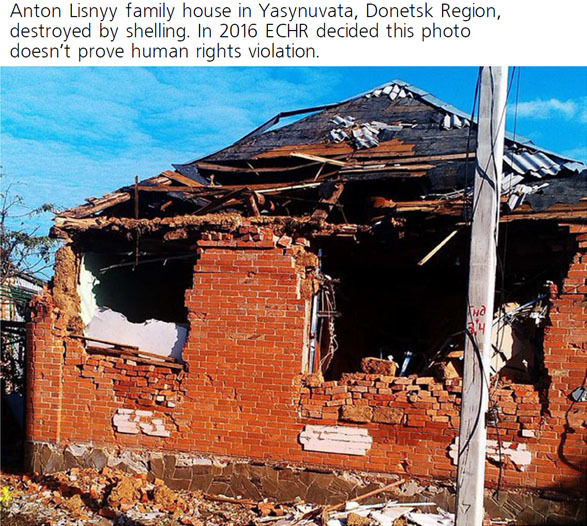 That’s why in absence of domestic remedies, including affordable expert evaluation of damages, victims of war petition to Strasbourg bypassing Ukrainian courts and attaching as evidence photos of ruined home and copies of passport with residence registration address. Ms. Tselovalnichenko always asks petitioners to provide as many information and documental proofs as possible helping them to fill standard ECHR application form. Frequently they transmit documents from Donbass to Kyiv with relatives or friends fearing to cross demarcation line. 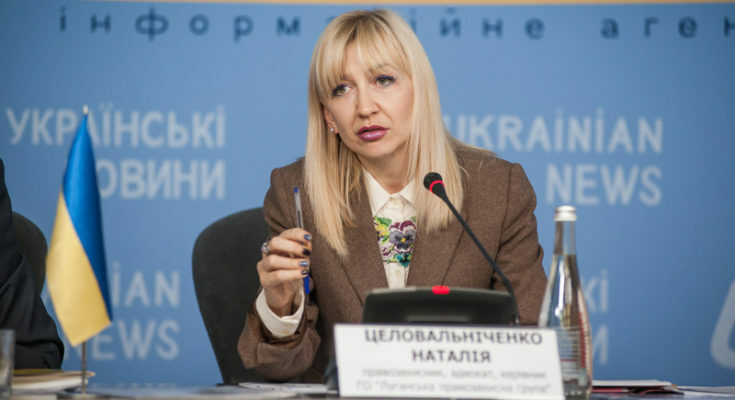 Ms. Tselovalnichenko insists that a lawyer bound to rely on copies of documents provided by applicants because it is ineffective and expensive to request such copies directly from officials in Ukraine, and even impossible on territories occupied by Russia. 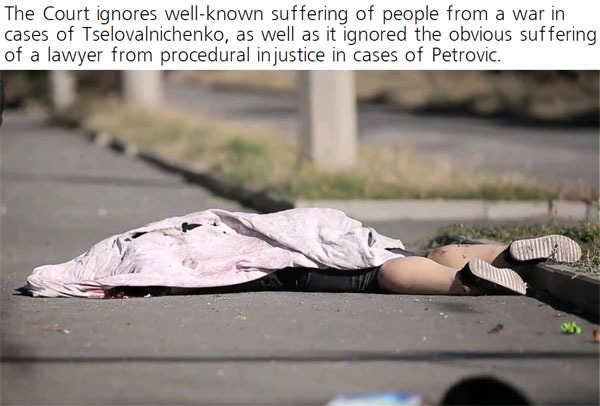 Apart from lodging applications before ECHR, Ms. Tselovalnichenko helped thousands of people to receive in Prosecutor General’s Office of Ukraine status of victims in a criminal investigation of the military aggression of Russia against Ukraine. She hopes the investigation sometimes will gather proofs of damages caused to victims or else, at least, people can ask compensations for improper investigation. Trust in European justice, however, was killed soon by ECHR beadledom. No substantial proceedings are taken from 2014 until now to resolve complaints of people suffered from human rights violations during the armed conflict at Eastern Ukraine. Even decisions to postpone hearings of individual cases in favor of inter-state cases were postponed per se in 2016 by the letter of the Registrar with a smug remark that “it is for the Court to decide on the order in which it examines the cases pending before it”. Only one infamous decision on the inadmissibility in the case Lisnyy and others v. Ukraine and Russia was taken in 2016, as explained judge Ganna Yudkivska in 2018 interview to Europejska Pravda, to establish a framework of declaring inadmissible fastly other hundreds of similar applications. Formal adjournment of individual applications related to Eastern Ukraine in favor of inter-state case was announced by ECHR only 17 December 2018. Thousands of applications of victims of war were rejected with disappointing formalism, ignoring even generally known facts such as dangers to life and property of civilians in a zone of armed conflict. All requests for interim measures were ignored, including requests to prioritize the cases, to order Russia and Ukraine stop threatening lives of people and investigate war crimes. Instead of performing the mission of human rights defender, ECHR denies people in access to justice, camouflaging such disgraceful policy by unsubstantiated accusations of Ms. Tselovalnichenko in fraud and forgery. 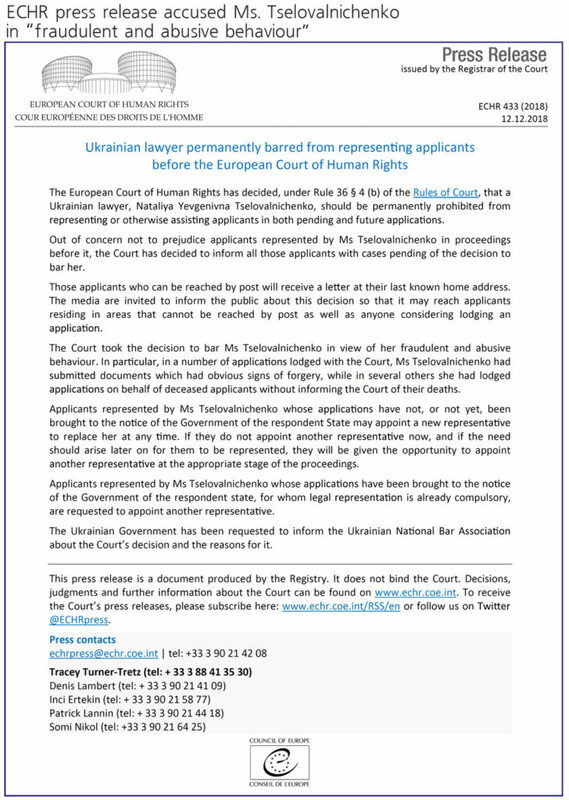 After the public questioning of Nataliya Tselovalnichenko, the Bar Council of Ukraine decided to appeal to European Court of Human Rights and to Council of Bars and Law Societies of Europe, warning that presumption of guilt of an attorney, introduced in her case, will incur negative consequences for all advocates in Ukraine and Europe. Considering the clear contradiction between public accusations made by ECHR press release referring to the decision of the Court, on the one hand, and further reply on our request stating that such a decision can’t be published or delivered in form of official text, because “it was an internal decision of a procedural nature”, on the other hand – we came to conclusion that so-called ECHR decision on disbarment of Nataliya Tselovalnichenko is highly likely legal fiction fabricated to scapegoat nonconformist lawyer. ECHR Press Unit provided to Pravdoshukach Newspaper the next comment on facts of backstage punishments of lawyers for mass petitioning without public trial, without a chance to appeal, without proper investigation, but with public shaming by vague accusations: ‘The decision to issue a press release in relation to the barring of an Ukrainian lawyer as a result of her “fraudulent and abusive behaviour” was taken simply because of the large numbers of applicants that she represented, many of them beyond the reach of postal services, and to ensure that they were informed of the situation so that they could take steps to appoint another representative where this was necessary. This is not the first time a press release has been issued in similar circumstances’.